Each morning when I wake, I vow to write at least five pages. Some days, I don’t finish any pages. Before my feet hit the floor, I’m reaching for my iPhone to see who has emailed, inboxed, or re-tweeted me. It would be rude not to read what people have taken the time to say to me. I must respond to them in a timely manner! So, I spend at least another 10 minutes in bed scrolling and smiling. After all, reading text messages or posts from my favorite authors, blogs, and book groups isn’t procrastination. It’s part of the job description! Next, I go down for coffee and while I’m in the kitchen, I peek at Twitter to see what is trending. A writer has to stay informed. All the while, my characters sit patiently waiting. They are the perfect children—obedient and good. Not at all like my real children! Consequently, they’re easy to ignore. There’s nothing wrong with going down for coffee, you may say. Aha! My mistake is staying downstairs too long. If I don’t creep back up in 10 minutes, my husband, who has risen an hour and a half before me, will spy me and pull me into a conversation or torture me with DVR’s and rewinds of “important” news that, in his opinion, is world changing and earth-shattering. When I finally escape him and get back to my office which is upstairs, I discover that I’ve left something downstairs. Often, it’s my flash drive which I have taken down in case I want to work from our shared computer in the kitchen, but which I rarely use for writing. So, I race back down to get it. By then, I’ve forgotten why I came down, so I stay until it comes back to me. At that point, I’m caught up in a new, albeit important, endeavor (shaking my own head here). I make lunch and get caught up in episodes of Law & Order. I garden, shop, or make lists of what I’m going to clean when I feel the urge to clean! Finally upstairs (for real this time), I answer telephone calls that aren’t very important, and I write blogs like this because how am I going to become a better writer if I don’t share my faults with my readers. Some of you will say I’m not a writer and that may be true, but I’m a damned good storyteller. The stories I have in my head would BLOW your mind! I could blog about them. Maybe I will email or inbox you their outlines. I will soon! First, I’m going to take a look at Twitter to see what Rave Reviews Book Club members are tweeting about! #RRBC Congratulations, Matthew Armstrong! It’s Your Day! Oh dear – you’ve got my been there, seen it, doing it later Tee shirt too? Commiserations Linda! 😉 I’m off to start my overdue by 24 hours 1st thrash at a NaNoWritMo project… after I’ve get a coffee of course! Comments to my ramblings are so rare, Jan, that I missed this one. 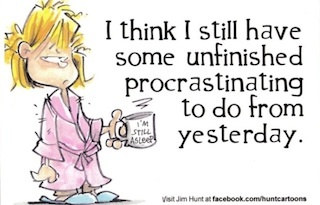 I’m still at it though—procrastination, that is! LOL!